^^I mean…WHAT a difference! 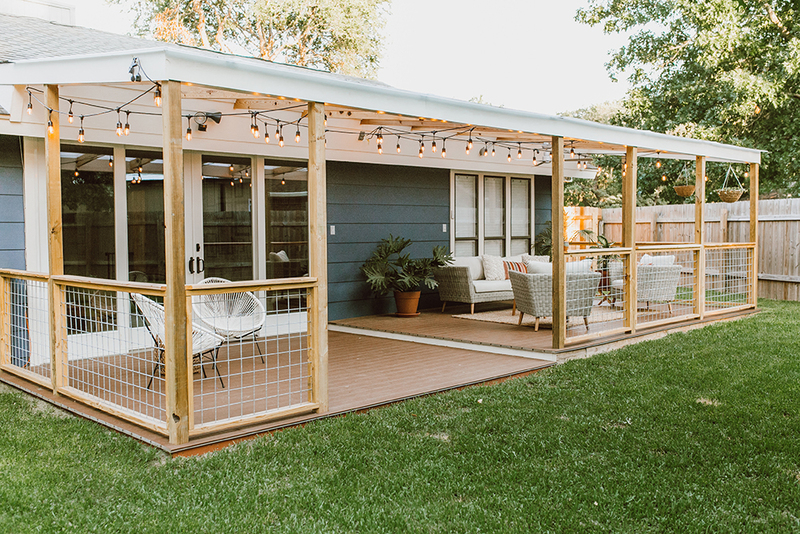 We are on cloud 9 about this reno!! 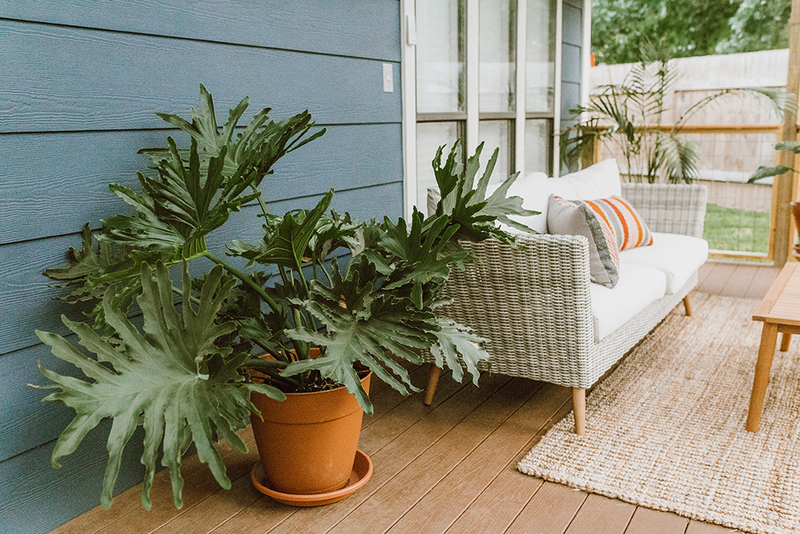 Hello, patio sanctuary of our DREAMS! 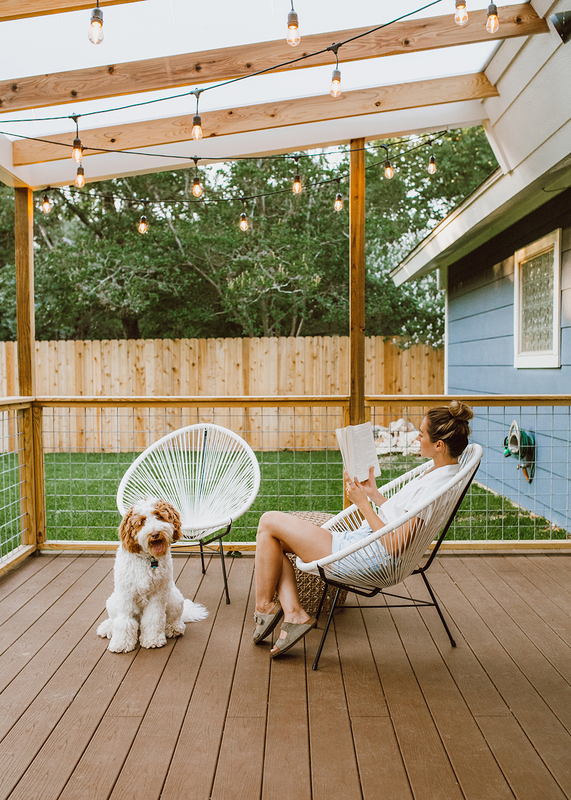 Let’s just say coffee in the morning, a midday book sesh and sipping wine at night under the twinkle lights is on the agenda everyday this summer. Even when our patio looked a little (okay, a LOT) funky from when we moved in, Blake and I were still outside soaking it up daily. 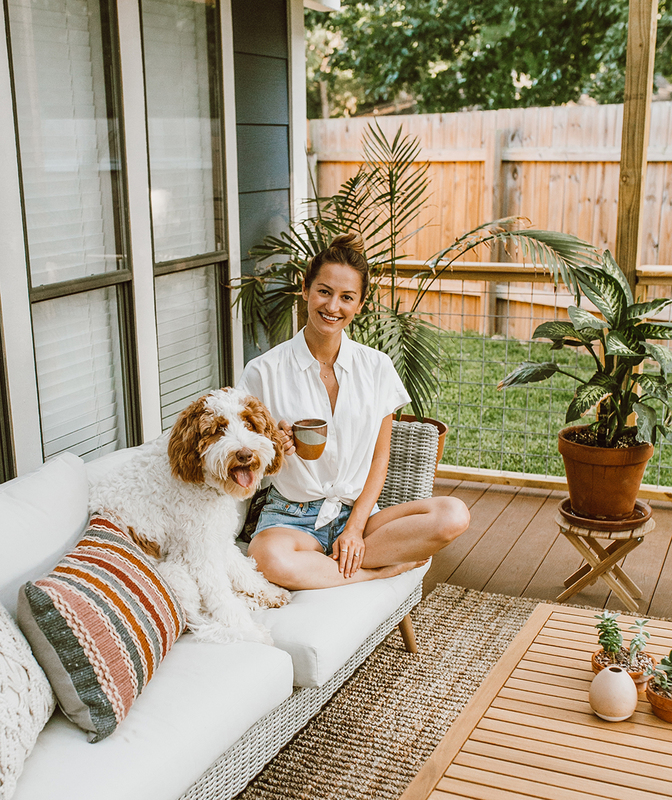 The Texas heat gets super intense, so we were only able to be out early in the morning and as the sun was setting – but now that we’ve got the cover, Watson and I can go hang out at 2pm (…with the fan on full blast, of course haha). When brainstorming our ideal furniture situation, the number one word that came to my mind was ‘comfort.’ Growing up, I remember my aunt always creating a sanctuary space out of her patio (whether in a house, apartment, duplex – you name it, she had a knack for transforming a patio space no matter how big or small) and the one thing that sticks is my mind (10 years later!) is just how comfortable her outside seating was. It was always inviting, had lots of character and the seats were plush enough that you’d want to sit and chat for hours. Thus, I kept that at the forefront of my “must have” list when shopping around for furniture. I looked at a LOT of different retailers and the one set Blake and I kept coming back to was this mid-century set by Clay Adler from Overstock.com. 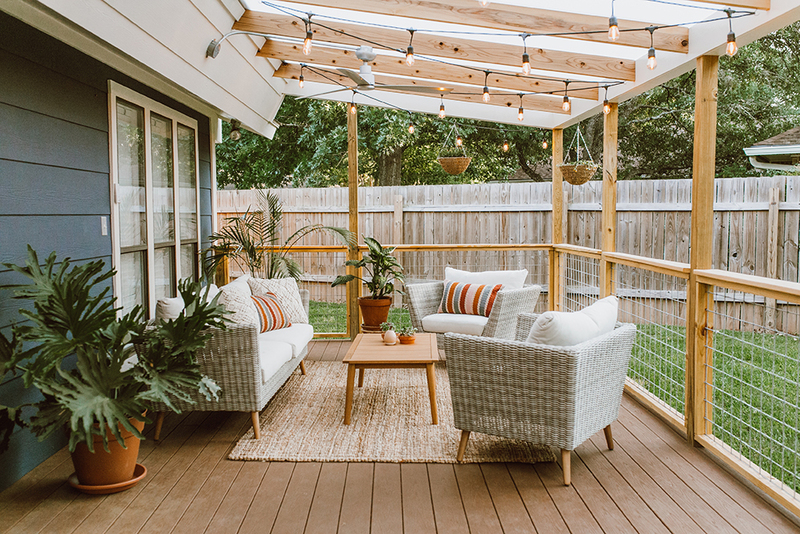 We narrowed it down between a few conversation sets, but ultimately decided that the modern silhouette with traditional materials (wicker) was what we liked most. The furniture is gorgeous and really fills out the space so nicely. We also put down a jute rug (we used a size 6′ x 9′) to complete the space and make it feel more cozy. Lastly, we hung a couple of woven planters to add some flowers and a pop of color. These were super easy to hang and are lined so all you need to do is buy the flowers and add some potting soil…definitely my kinda planters! It all works so well together and feels really tranquil – which is exactly as we’d hoped! Overstock has so many amazing options at all different price points, but we particularly loved their wicker conversation set selection. 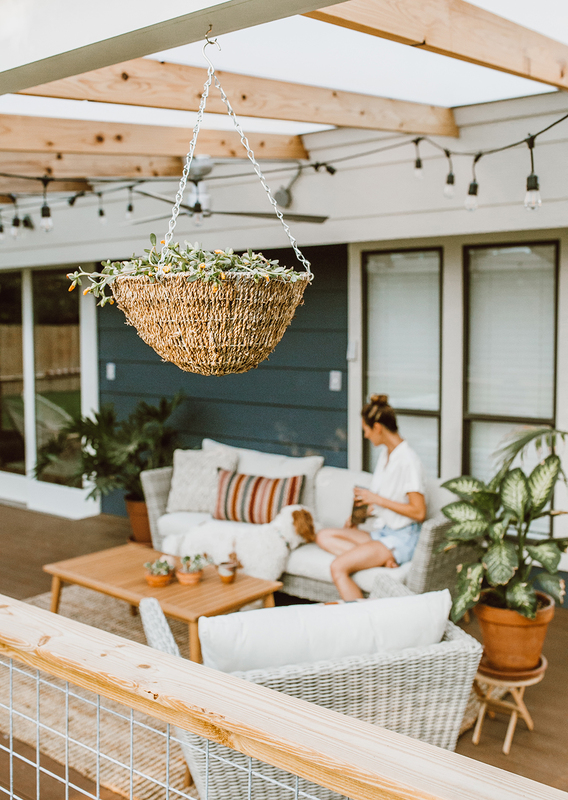 Given that our patio has a step, it is naturally divided into two areas – one to fill with furniture and the other used as more of a walkway to and from the sliding doors. 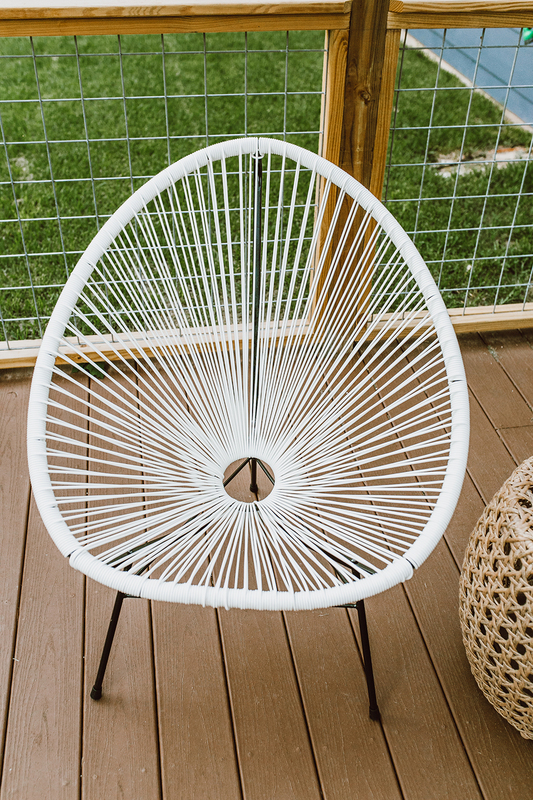 We didn’t want the lower area to feel empty, so we scooped up two woven basket chairs (omg these are SO comfortable and look amazing!) – they come in a set of two, called the Acapulco Basket Lounge Chairs. 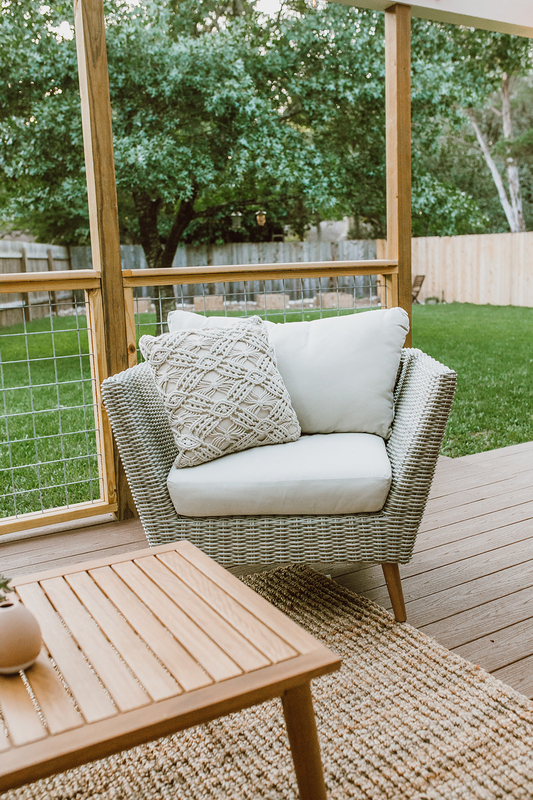 This area is perfect for relaxing while I play fetch with Watson throughout the day, and we love that if we have more guests over there are plenty of seating options! 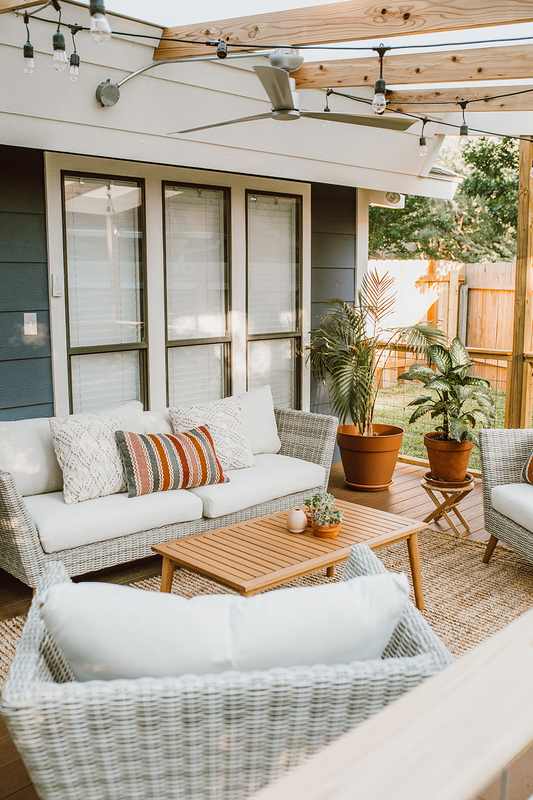 Also – I feel like these chairs have such a chill, Austin-y vibe that works so great with the new navy siding on the house. Such a fan of this look! 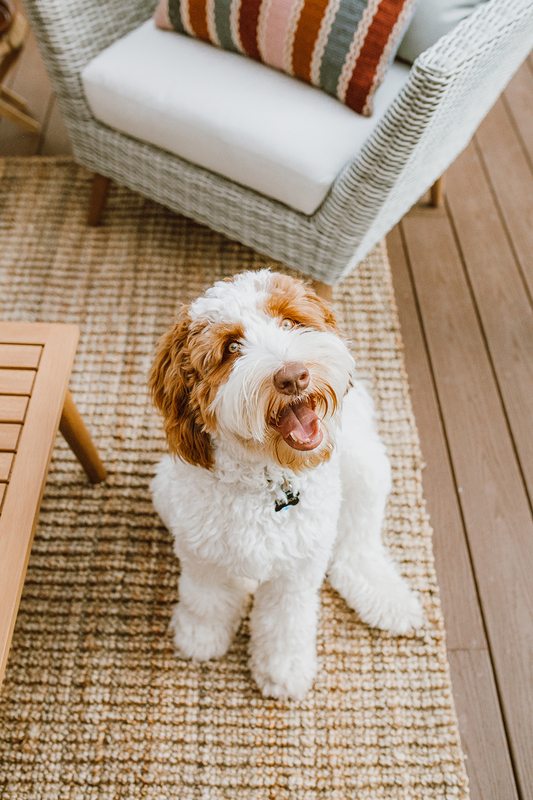 We are completely in love with how the patio renovation turned out…and as you can probably gather from above, Watson is digging the new look, too! Cheers to more relaxing evenings with friends and family in this beautiful space! Thank you so much, Diana! Was a huge project for us but we are so happy with how it turned out. 🙂 Have a great weekend, xoxo! Your dog is darling. Are you concerned about it getting your couch dirty? This turned out so gorgeous!! It’s so airy and looks so inviting! 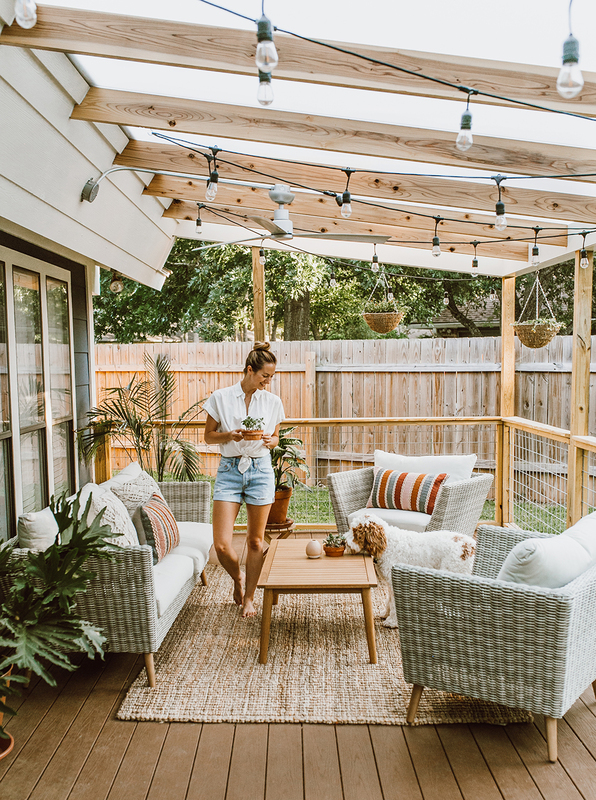 My boyfriend and I are planning on renovating our patio next summer and this is major inspiration! looking at the same patio set. Is it comfy? Hey Kate! It’s amazing! Super plush and really comfortable. We are loving it! This is exactly the inspo I needed! 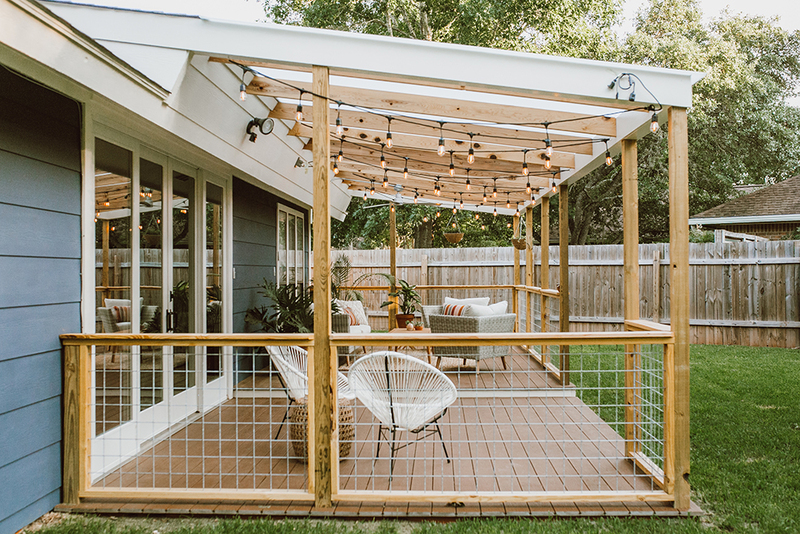 I am in the middle of a patio renovation myself and have been stumped on a good looking shade structure, I love what you did! What exactly did you do? It almost looks translucent? Please explain I am dying to know! Ah! Just found it in a separate post of yours, Polygal. Thank you!!! Can you share where you found this? I’d really like to know the material for this too! Thanks!!! Omg this is stunning! 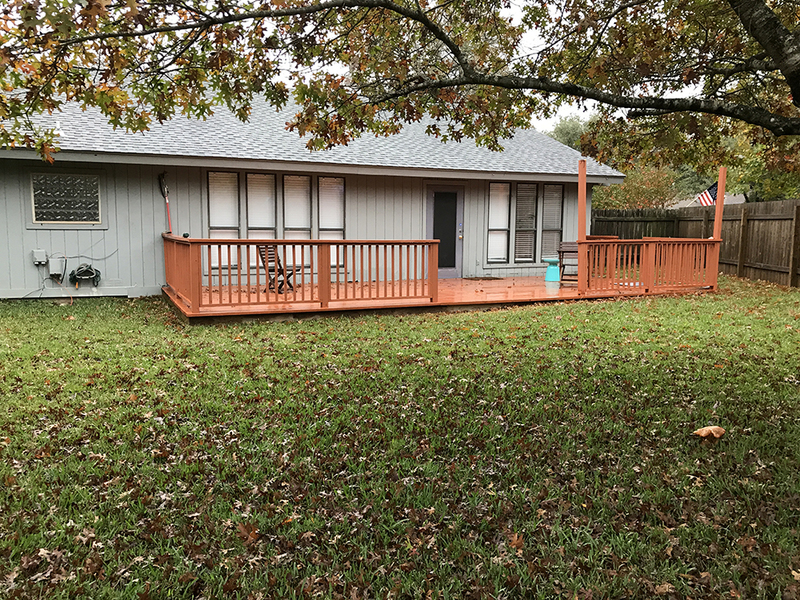 The before and after is incredible like you would see on Fixer Upper! 😃 Can I also quick ask where to find your button up? I love it! 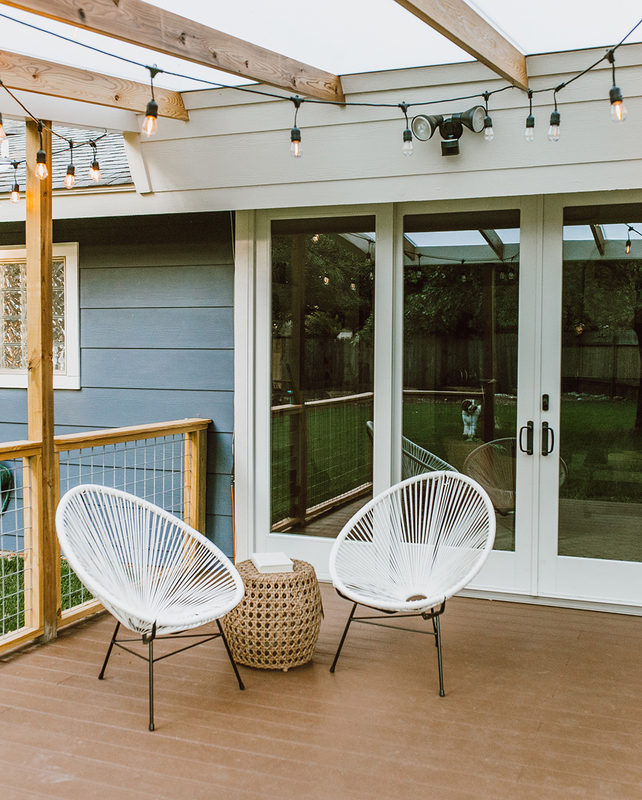 What material is the top of the patio/covering? Thank you for that!! This was my same question!!! I’m about to buy a house and am planning on including a patio reno in my reno budget. I LOVE yours! 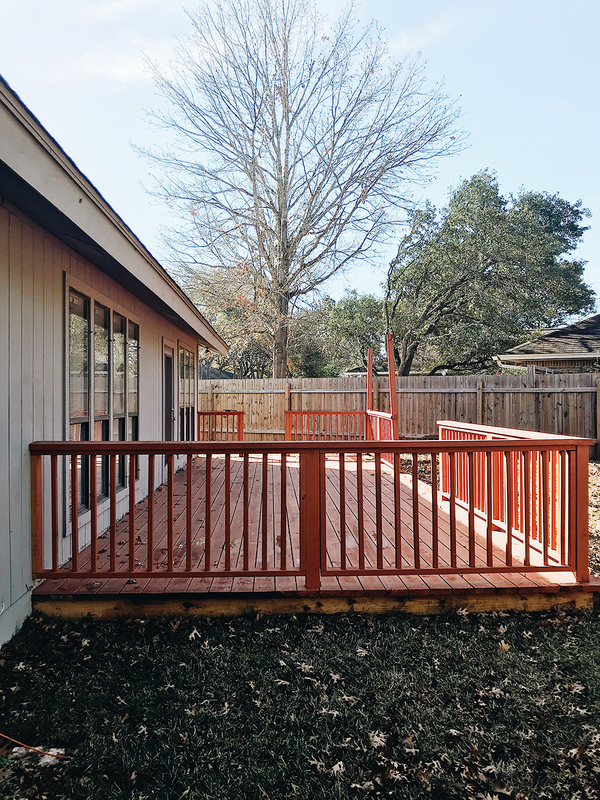 Could you give a rough estimate of the cost minus furniture? OMG I swear you are living the DREAM! Haha, well at least my dream 😉 But seriously, your patio came out beautifully and Watson is just the cutest! Can’t wait to own a house one day (once we leave NYC) and have a great outdoor space like this! Is that the central or courier shirt? Love your blog!! Hey Andrea! I totally understand!! I will be doing a second post within the next week sharing the details on all the materials we chose (with a video component…waiting on that to be edited and then I can create the post!). 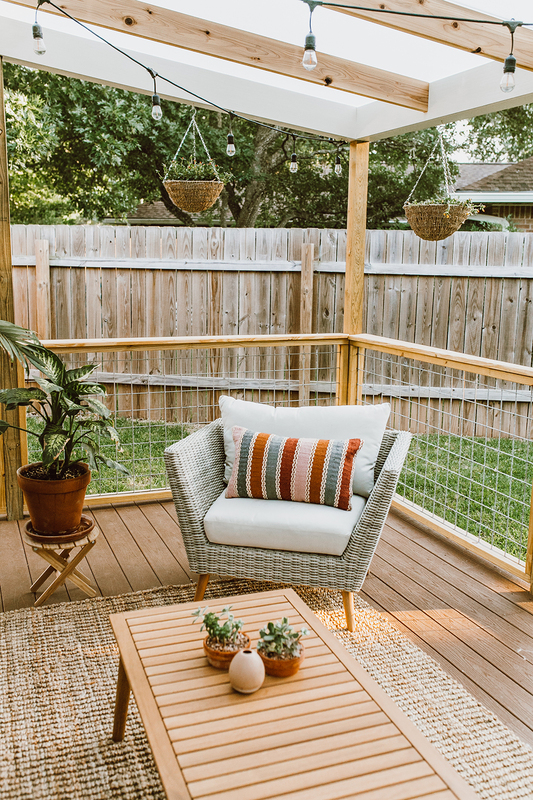 The fencing is “chicken wire fence” – I have seen it quite a bit around Austin lately, we love it!! Beautiful! Thank you for the idea!!!! Love your dog too! Livvy, Beautiful patio! I’m curious…what color is your house paint?? I want to know too, I just love the color. Gorgeous! I’d love to know paint colour as well! Thank you. This is really a lovely reno, what is the cost of putting together something like this? hi – love the transformation! can you share who you worked with in austin? I’m looking to do something similar and want to work a trusted contractor. 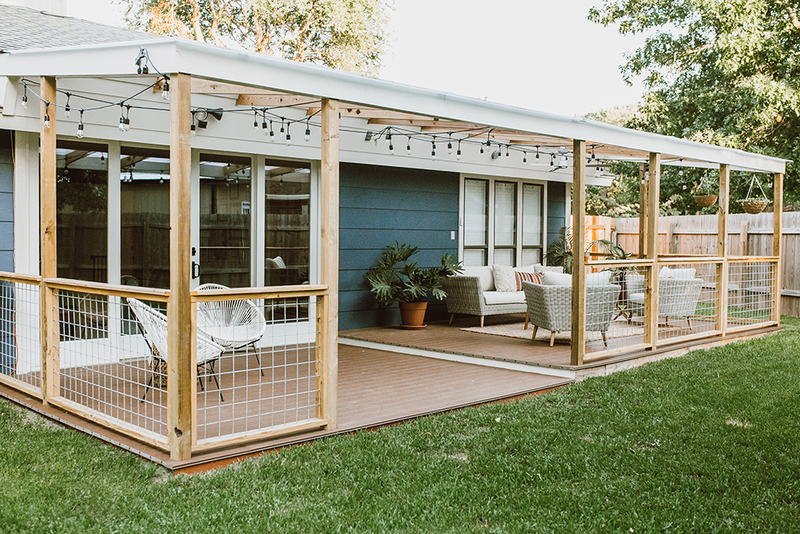 Thanks for showing how you tied the porch roof into your existing roof – this is exactly what I want on the back of our ranch but wasn’t sure how that would work! Gorgeous!! Simply Lovely! I was wondering what’s the material you used for your roof. Gorgeous! Trying to figure out how big I need to make my patio right now. What are the dimensions for this? Seems to be the perfect size! 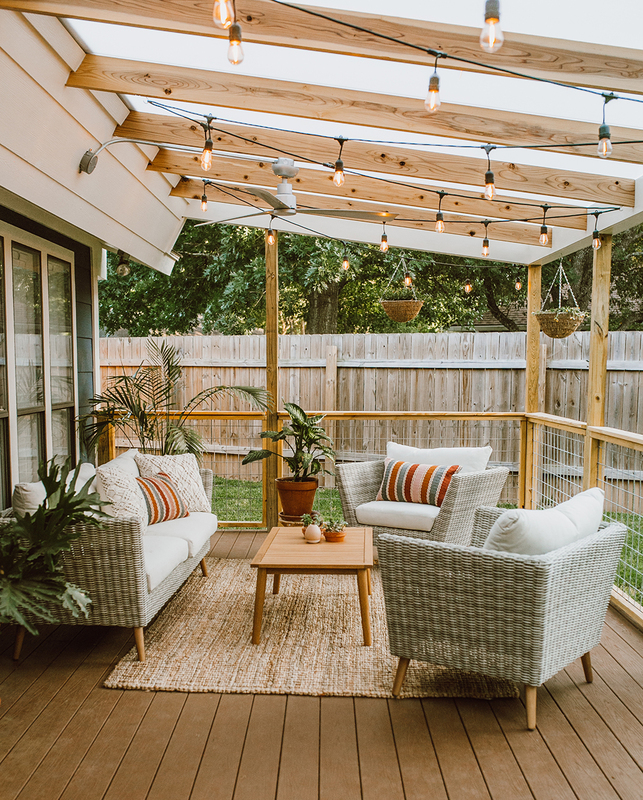 I absolutely LOVE your patio setup! I just bought that rug after seeing your setup 🙂 Can I ask where you got your decorative pillows from? Thanks!! Are you concerned about the couch getting dirty? Aw thanks! 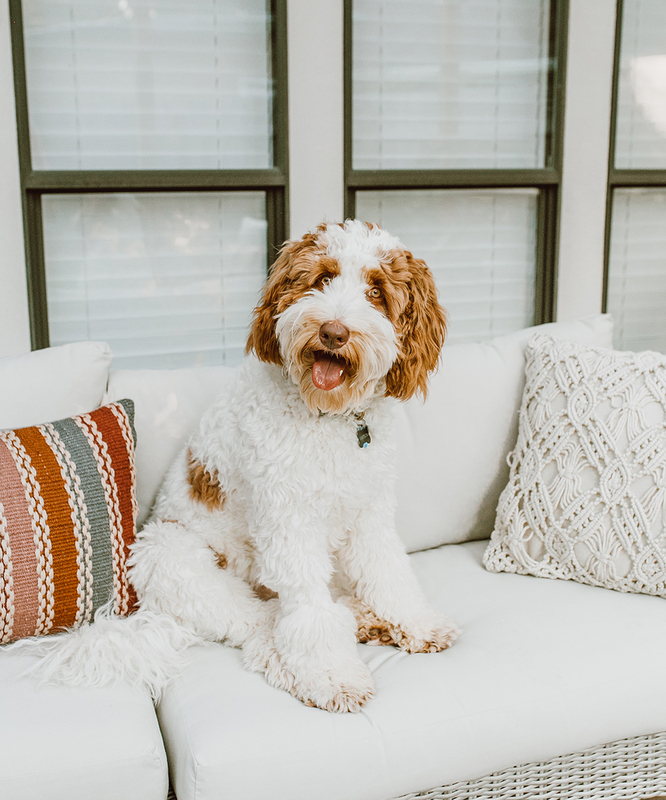 Ohh yes…and we got another dog since I shot this post so that sofa gets dirty ALL the time. The good news is that the cushion covers are washable and look good as new with a quick wash! Also, the set came with a charcoal grey cover option so we switch them out from time to time. Would LOVE for it to stay clean all the time, buuut such is real life over here, ha! Hi! 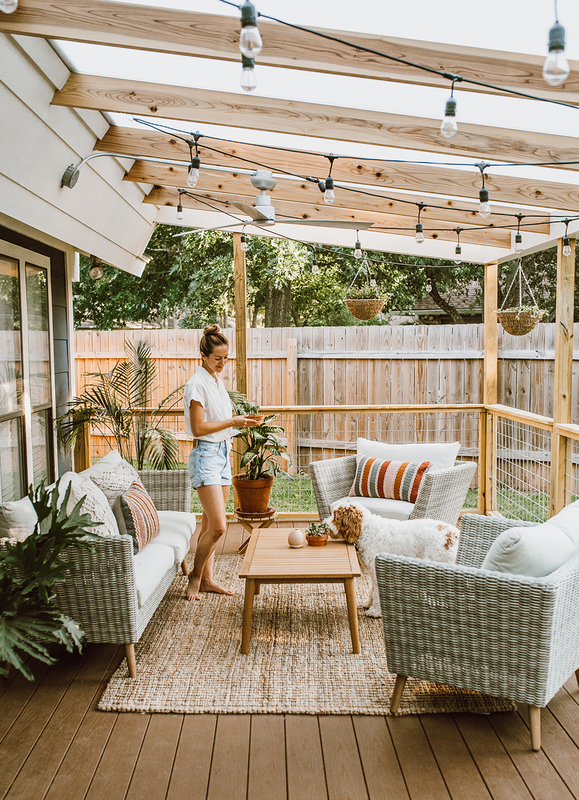 I just stumbled on this post while looking for inspiration for my deck renovation – wow this is beautiful!! What type of railing did you use here?? I’ve been looking at cable railing for my deck but have only seen horizontal or vertical railing – nothing like this. So beautiful and major inspiration!! Can you share where those perrrfect sliding doors are from?? We’re mid-reno and searching with no luck. Hey Tiffany! These are by Andersen, we got them through Home Depot. 🙂 We have loved them and the Andersen team has great customer service…big fan! Hi! I just stumbled upon this from Pinterest. I want to cover my back porch, but have struggled to find a way because of our roofline. Yours is the same as ours. Do you have the plans/blueprints for the structural portion? I’m wondering how you connected it to the existing roofline and what the gutter system looks like. Thanks! WOW that patio is really stunning. I love the open air feel to it and what a beautiful doggo.